This giant snail has a narrow, conical shell, which is twice as long as it is wide and normally contains 7 to 9 whorls when fully grown. The shell is generally reddish-brown with some weak yellowish vertical markings, but the colour can vary with environmental conditions and diet. Achatina fulica is originates in the coastal areas and islands of East Africa. This species can be found from Mozambique in the south to Kenya and Somalia in the North. This snail as also been introduced into many different countries, as for example Brasil, USA and Australia. This is not a migratory species and has been introduced by anthropogenic activities as agricultural transportation, commerce, trade, vehicle attachment, smuggling and some other accidental or purposeful ways. This species is an obligate-outcrossing hermaphrodite, which means that one externally fertilised snail can establish a population. They can lay up to 100 eggs in their first year and up to 500 in the second year. The fertilized eggs of this species are laid in a nest, or in the dirt and leaves as a form of protection and disguise of the eggs. Eggs hatch in anything from a few hours to 17 days and the snails mature at around 5 to 15 months, depending on the temperature. Herbivores, feeding primarily on living and decaying vascular plant matter. The food is located by the specimen by its sense of smell, being mainly attracted to garden crops. This snail has a remarkably broad range of host plants on which it feeds and seems to prefer soft textured banana, bean and marigold. Achatina fulica has an economic importance as a medical and protein source. Considerable amounts of this species’ meat are exported to Europe and America from Asian countries. 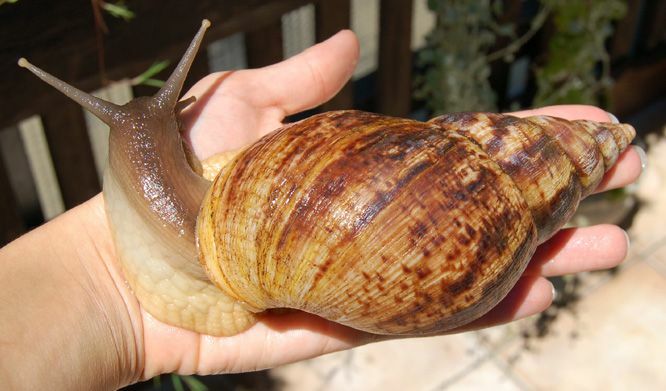 In addition to farming for meat Achatina fulica is used as laboratory animal in temperate regions outside Africa. Loss of crop yield caused by herbivory. Damage may be caused by the spread of disease through the transmission of plant pathogens cost associated with the control of the pest. A. fulica distributes in its faeces spores of Phytophthora palmivora in Ghana; P. palmivora is the cause of black pod disease of cacao (Theobroma cacao); the oomycete which also infects black pepper, coconut, papaya and vanilla. A. fulica are also a general nuisance when found near human habitations and can be hazardous to drivers, causing cars to skid. In many Asian, Pacific and American societies fulica may play a role in the transmission of the metastrongylus causative agents of eosinophilic meningoencephalitis (Angiostrongulus cantonensis and A. costaricensis). Metaldehyde and/or calcium arsenate were used in early attempts to control A. fulica. Global Invasive Species Database (2017) Species profile: Achatina fulica. Downloaded from http://www.iucngisd.org/gisd/species.php?sc=64 on 30-03-2017.